For decades men have had ALL the fun when it comes to socks. Even the guys dressed in custom Hugo Boss get away with rainbow polka dots on their feet, how is that fair? If I walked into a boardroom wearing a black suit dress and pink socks, people would be horrified. Good news for my fashion forward females- coming out in full force on the SS16 runways last September and continuing strong at the shows this February, it is ALL about women and their funky feet. Tights are also on the rise as a quasi sock. Something I haven't seen before but am in FULL support of- I actually wore fishnets under my mom jeans to the AnnaK Fashion show yesterday and killed it, obvi. If you have the room in your pants to wear the tights underneath- DO IT. Especially in winter. HELLO CHIC NEW LAYERING TRICK. 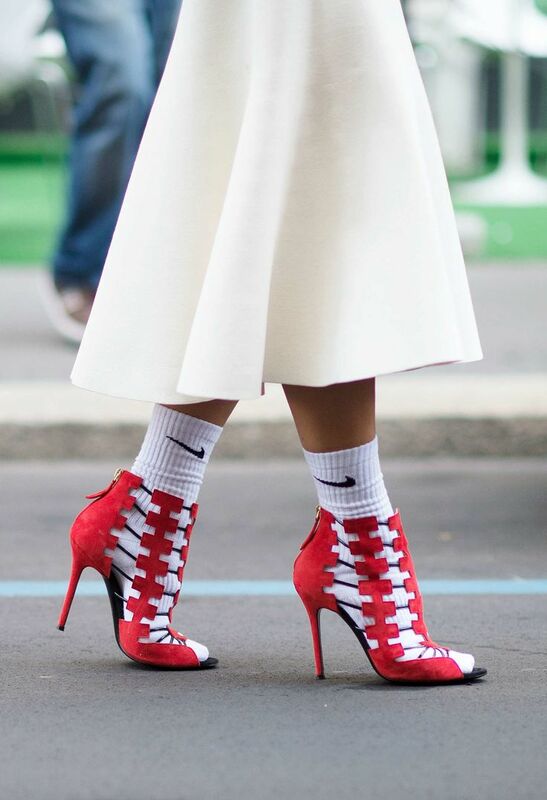 Love it or hate it- socks and heels aren't going anywhere.